An aerial photo, taken March 18, 2012, of First Wind's 60 megawatt, 200 wind turbine Rollins Wind project, 8 miles east of Lincoln. The nearly 400-foot-tall turbines atop Mars Hill Mountain had been spinning for several months when, on March 27, 2007, the facility quietly marked a historic moment in Maine’s energy history by selling electricity into the power grid. The Mars Hill project formally opened the door in Maine to a renewable energy industry that had been discussed for decades but, prior to that day, had never amounted to more than talk. Five years later, Maine is the largest source of wind energy in New England. The 205 commercial wind turbines spinning on Maine mountaintops, ridgelines and coastal islands are rated to produce enough juice to light more than 6 million 60-watt bulbs. But like most growth spurts, Maine’s rush into wind energy has not been pain-free. Lawsuits, regulatory challenges and financial problems have slowed or snuffed out numerous projects. Alarmed by stories told by turbine neighbors elsewhere, voters in towns across Maine have banned commercial wind power near their homes. Federal subsidies that fueled wind power’s dramatic national expansion are at risk of expiring amid the changing political environment in Washington, D.C. And in Augusta, the LePage administration wants lawmakers to revisit key policies written by their decidedly pro-wind predecessors — starting with dropping the state’s optimistic but symbolic goal of generating 2,000 megawatts from wind power by 2015. Turbines already installed in Maine can produce nearly 400 megawatts when operating at maximum capacity. Despite the rapid development of the industry during the past half-decade, wind energy represented just 6.6 percent of the total electricity generated in Maine in January 2012, according to figures from the U.S. Energy Information Administration. Hydropower, by comparison, accounted for 25 percent of Maine’s total electricity generation. Nationally, Maine’s wind farms generated less than 1 percent of the nation’s total wind energy production in January 2012. Production of wind power in Maine increased by roughly 59 percent between January 2011 and January 2012, roughly equal to the national average. Yet Maine’s wind power sector has grown from almost nothing a decade ago into one that has funneled more than $1 billion and created thousands of jobs, according to an industry group, much of that during an economic downturn. And industry representatives insist Maine is poised not only to remain as New England’s top source for sought-after wind energy but potentially to become an international leader in the arena of offshore wind production. A 2010 survey found that 88 percent of Mainers support wind power in the state. Rural and economically challenged aptly describes Mars Hill, an Aroostook County town located about 15 miles south of Presque Isle on the Maine-Canada border. The 28 turbines operated by First Wind — New England’s largest wind power company — sit atop a 1,700-foot-tall mountain that dominates the horizon and, in winter, is a popular ski destination for locals. The Mars Hill project may have paved the way for future wind farms but it also left a legacy that continues to haunt the industry in Maine. Although the project has enjoyed strong support from Mars Hill officials and many town residents, some neighbors of the 28-turbine project were expressing concerns about the turbines as soon as they began spinning. Upset residents accused First Wind of downplaying the potential noise created as the nearly 125-foot-long blades sliced through the air, especially at night and when atmospheric conditions were right for carrying the sound. Affected neighbors have complained about sleep deprivation, headaches and decreased financial and aesthetic values of their homes. The noise problems at Mars Hill have come up at almost every regulatory proceeding on wind power since. And five years after Mars Hill became operational, First Wind only recently reached settlement agreements with more than a dozen homeowners who had pursued court action against the company. Those settlements reportedly included payments from First Wind to the complainants in exchange for their agreement to drop all claims against the company. Peter Kelley, a Caribou attorney who represented the complainants, declined to discuss the settlements because the parties are bound by a confidentiality agreement. Michael Gosselin is the sole complainant who has yet to settle with First Wind. A disabled Vietnam veteran who moved to Mars Hill 21 years ago from Rhode Island to escape noise, Gosselin claims the turbines affect his sensitive hearing and disturb his sleep even though his house is located nearly two miles away. First Wind officials point out that the town of Mars Hill receives $500,000 a year in tax payments for 20 years from the project and that the facility employs nine people full time plus additional temporary workers throughout the year. But they also acknowledge that, as the first wind energy project in Maine, Mars Hill was a learning experience for all. 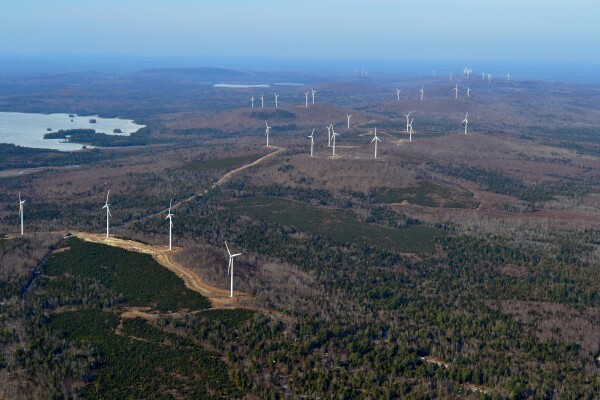 While the Mars Hill controversy has undoubtedly influenced debate over wind power in Maine, it has not had a major impact on the success or failure of subsequent permit applications for new wind farms. Only three major projects — in Redington/Wyman Townships, Highland Plantation and Carroll Plantation-Kossuth Township — have been turned down by regulators, withdrawn or have requested withdrawal in the face of likely rejection since March 2007. And the latter two may be refiled with modifications. By comparison, state or local officials have approved 13 separate commercial wind power projects since 2007, representing 274 additional turbines and 627 megawatts of electricity. Eighty-six of those yet-to-be-built turbines have been approved under Republican Gov. Paul LePage’s watch despite perceptions that the current administration is l ess supportive of the wind industry than Democratic Gov. John Baldacci. “At the end of the day, projects continue to be proposed, continue to be permitted and continue to be built, so that says there hasn’t been a lot of change,” Payne said. There have, of course, been notable changes to Maine’s regulations during the past five years, some intended to facilitate the development of wind power and others attempting to address concerns raised at Mars Hill and other sites. From the pro-development side, the most significant was a Baldacci administration policy that streamlined the permitting process and reduced the importance of scenic impacts for any projects proposed throughout much of rural Maine. The LePage administration said this week that they hope to revisit aspects of the so-called “expedited permitting” process, including scenic impacts. The Legislature also recently endorsed a Board of Environmental Protection decision to lower the maximum nighttime noise level as measured from nearby houses from 45 decibels to 42 decibels. The change came after neighbors of two smaller wind energy facilities — in Freedom and Vinalhaven — also complained about noise disturbances. Although less aggressive than some had desired, the three-decibel reduction was interpreted as a small victory for the small but increasingly vocal and well-organized critics of commercial wind power in Maine. In addition to noise, opponents of commercial wind projects claim the facilities produce far less electricity than their megawatt ratings suggest, requiring fossil fuel power plants to remain online as backup. They also are heavily subsidized, change the landscape, can be deadly to birds and bats and require mountaintop areas to be cleared for roads and turbine pads. So where is Maine’s wind power industry headed? Will hundreds more 400-foot-tall turbines dot the landscape of rural Maine in 2017? Two projects — an eight-turbine proposal for Canton in Oxford County and a 14-turbine proposal for Grand Falls Township in Penobscot County — are pending with state regulators. Four more in Dixfield, rural Washington County, Bingham and an area west of Bridgewater in Aroostook County are under development. How many of those projects, if any, become reality likely depends on a host of factors, including: whether Congress reauthorizes federal tax incentives for wind power, the political climate in Maine toward renewable energy and the price of the fossil fuels that largely dictate electricity costs. On the federal front, action appears stalled on the so-called “production tax credits” that help wind power compete with cheaper fossil fuel-derived electricity generation. And observers suggest that Washington may punt the issue until after the November election. “It will change the pace of development if it goes away,” said Matt Kearns, First Wind’s vice president for development in the Northeast. The LePage administration has made clear that their top energy priority is lowering costs, regardless of the source of that electricity. As part of that campaign, LePage and Fletcher have been urging lawmakers to loosen requirements that power suppliers increase the amount of electricity derived from renewable sources, a policy regarded as a key incentive to the wind industry. The administration also has signaled that state utility regulators should not enter into long-term contracts with wind-power producers — as happened with First Wind’s Rollins Mountain facility — unless those contracts promote lowering the costs of electricity. Other New England states still can enter into long-term contracts with wind-power producers in order to meet their renewable energy goals, Fletcher said. “But this administration would not be in favor of asking ratepayers to pay more than they should have to pay just to support an industry,” Fletcher said. Fletcher added, however, that this should not be interpreted as the administration looking askance at wind power. Offshore wind energy, although likely a decade or more from commercial reality, stands to be a major potential source of renewable energy and University of Maine researchers could help produce the “breakthrough technology” that might make Maine’s heavy manufacturing industry a global leader. Wind power’s critics, meanwhile, are hoping the combination of the modest victories on noise regulations, uncertainty over federal tax credits and the LePage administration’s less-friendly relationship with the industry could signal a shift away from large-scale projects. “I don’t think we are going to have a lot more wind farms,” Williams said. “We may have more windmills, but the people I talk to around the state are more inclined to [support] regional projects where the local town or county gets the power” rather than feeding into the New England grid. Not surprisingly, Jeremy Payne, executive director of the Maine Renewable Energy Association, disagrees about the immediate prospects for an industry he describes as one of the only “bright spots” in Maine during the recession. “There is still substantial interest in wind in Maine and, quite frankly, I don’t see that slowing down,” Payne said. Five years after successfully launching Maine’s first commercial wind farm, officials at First Wind are watching the federal subsidies debate closely. Meanwhile, the company is moving forward — albeit perhaps at a slightly slower pace — with construction plans for a 50-turbine wind farm in the Aroostook County town of Oakfield and a 19-turbine facility near Eastbrook in Hancock County. Additionally, First Wind is developing plans for a wind energy facility in Bingham that could have more than 50 turbines and plans to continue exploring opportunities in Aroostook and Washington counties, both of which have been receptive to past projects. Correction: An earlier version of this story reported that the turbine blades are nearly 200 feet long. They are 125 feet long.